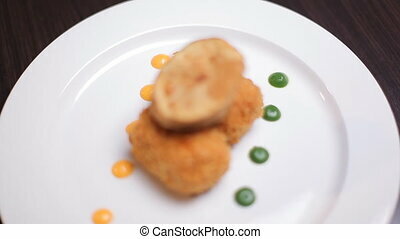 Chicken liver is laid out on a beautiful plate. preparation of salad of liver and pumpkin. 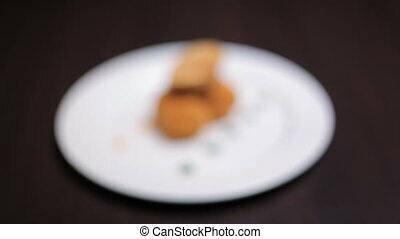 Chicken Liver Is Laid Out On A Beautiful Plate. 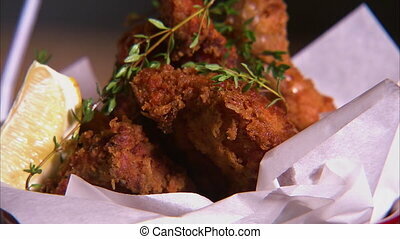 The man lays sprigs of rosemary on chicken pieces. 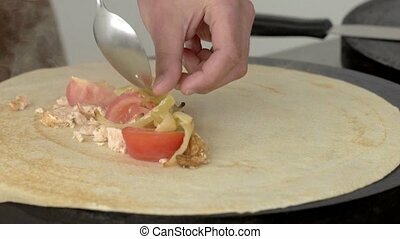 Meat, marinated in mayonnaise, is laid out on a baking tray. 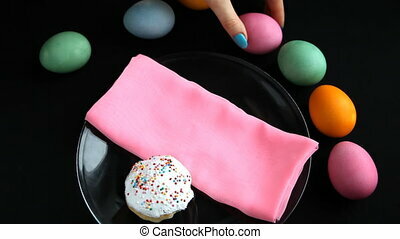 On the table stand a transparent plate with pink napkin and Easter cake. Near plate painted Easter eggs. Eggs beautifully laid out on the table. Accelerated video. On the table stand a transparent plate with pink napkin and Easter cake. Near plate painted Easter eggs. Eggs beautifully laid out on the table. 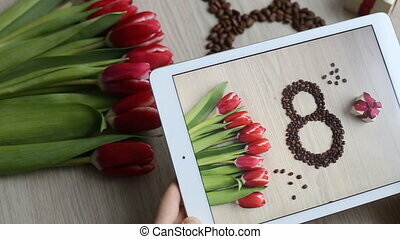 Are on the desk flowers - tulips, figure eight laid out from coffee beans and a gift. The gift is in the box with a red bow. Man is photographed all this on white table. 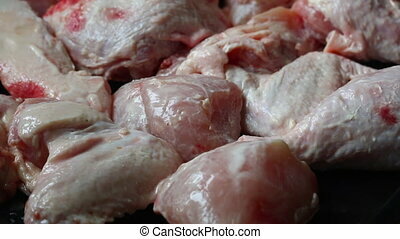 A close up detailed shot of a lemon chicken dish. 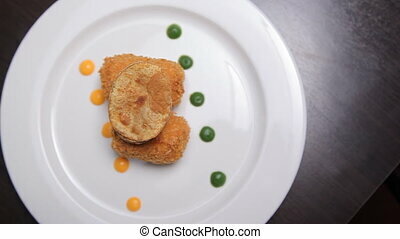 The chicken is fried and is placed on a beautiful plate. 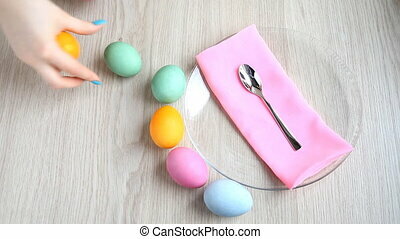 Hands lay out down on the table Easter eggs prettily. 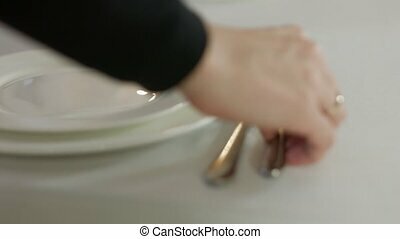 On the table is a plate with a spoon on a pink napkin. Fingernails blue. On the ring finger a gold ring with a silver insert. 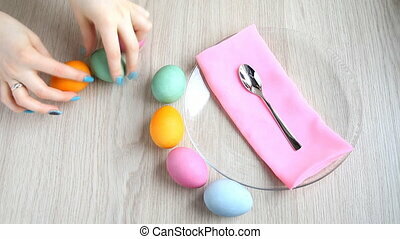 Hands lay out down on the table Easter eggs prettily. On the table is a plate with a spoon on a pink napkin. Fingernails blue. On the ring finger a gold ring with a silver insert. Accelerated video. 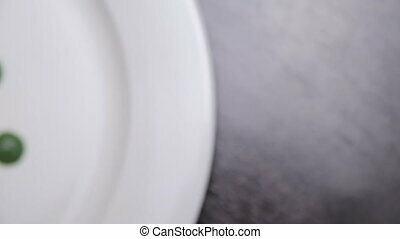 Chicken liver sprinkled with spices laid out on a beautiful plate, poured the butter. Preparation of salad of liver and pumpkin. Chicken liver is spread on a beautiful plate and collapses in sesame seeds. Preparation of salad of liver and pumpkin. 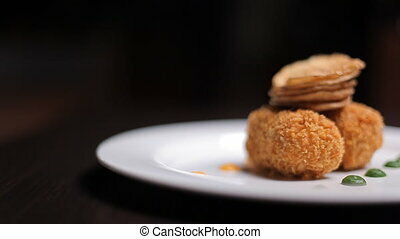 Chicken liver is spread on a beautiful plate and collapses in sesame seeds. Sprinkled in hand. Preparation of salad of liver and pumpkin. 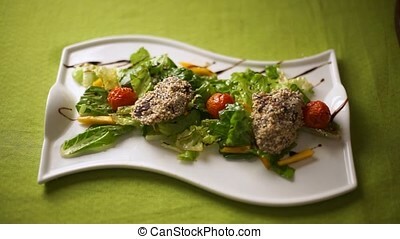 Cutlets from chicken liver in sesame, laid out on a pumpkin salad. Close-up, studio light. 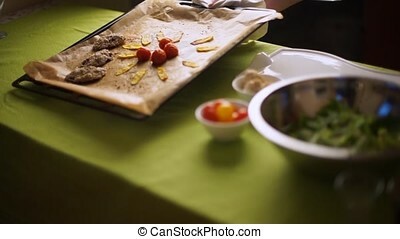 Display chicken liver sprinkled with sesame seeds on a baking sheet. Cooking a pumpkin salad. A tray is placed in the frame. Ingredients for salad with pumpkin. 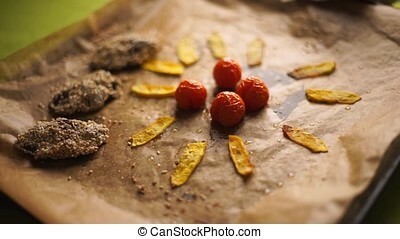 Spices, pumpkin, tomatoes, sesame seeds, salt, chicken liver. Preparation of salad of liver and pumpkin. Ingredients for pumpkin salad, tomatoes, pumpkin, sesame. 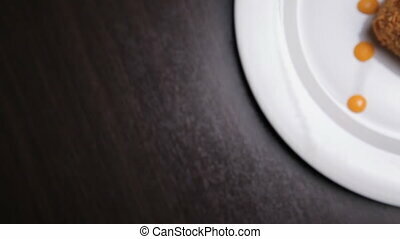 Posted in beautiful white cups, shot with slider. Sesame seeds sprinkled cheese balls laid out on a long white plate. Preparation of salad of liver and pumpkin.